Beetroot Pulav/Beetroot Rice is a very flavorful, colorful, healthy and a tasty lunch box recipe that the kids will instantly fall in love with. This is one of the best ways to make the kids eat the vegetables. Some people avoid beetroots because of its sweet taste, but this Beetroot pulav, is a perfect blend of spice and very mild sweet taste that lingers in your taste buds. Beetroots are great source of vitamins and minerals and rich in antioxidants. 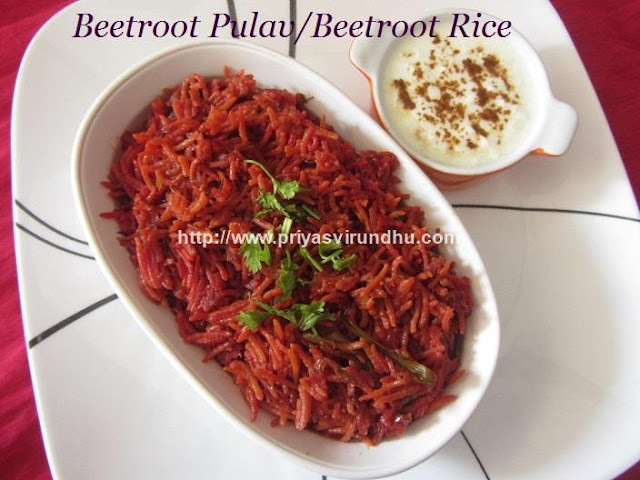 Try out this healthy and super delicious Beetroot Pulav and post your comments here. 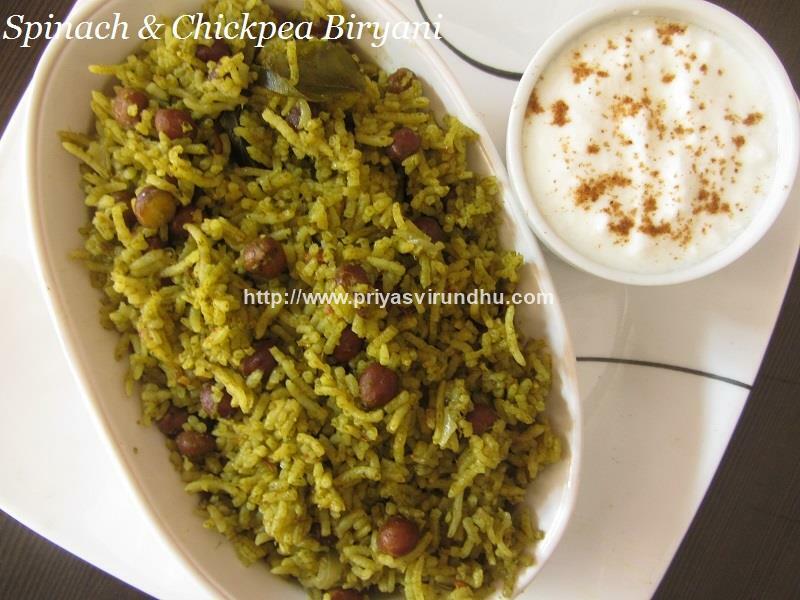 Meanwhile do check out other interesting VegRice Varieties and Non Veg Biryani’s here. 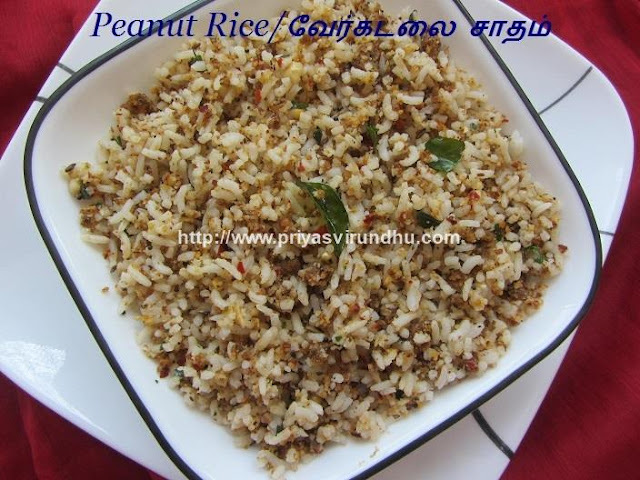 Today, I am going to share a very flavorful, easy and quick Peanut Rice/ வேர்கடலை சாதம். This is one excellent lunch box recipe that can be made in jiffy and packed for lunch. 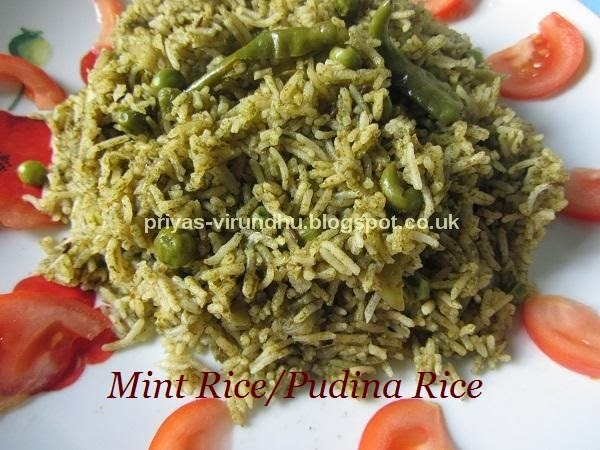 So without much delay, I am moving on to the recipe, do try out this Peanut Rice and post your comments here. Meanwhile do check out other interesting Vegetarian Rice Varieties, NonVegetarian Rice varieties here. 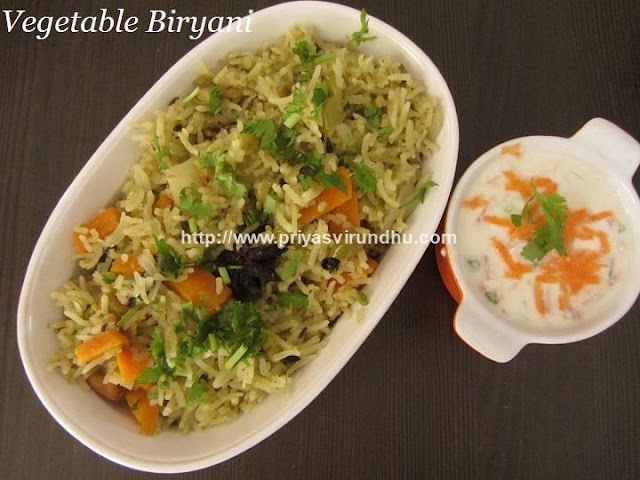 Are you looking to make easy, tasty and tempting vegetable biryani, then here it is – lovely, flavourful and tasty Vegetable Biryani. It is a perfect recipe for lunch box and week end lunch. 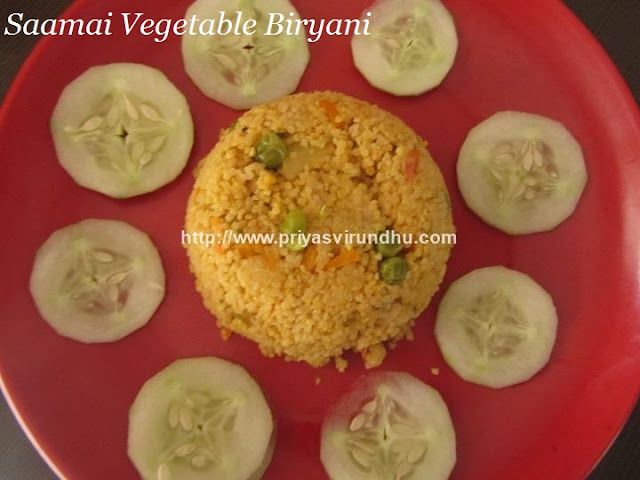 I have already posted Vegetable Biryani using pressure cooker earlier; do check that out as well. 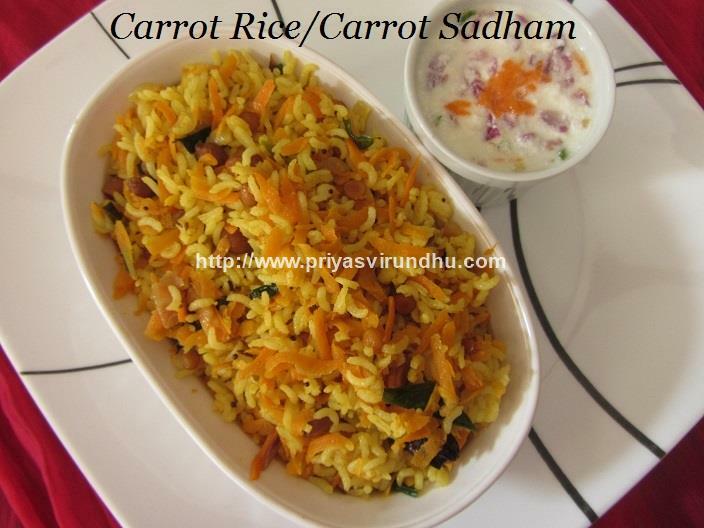 Do try out this Vegetable Biryani and post your comments here. Also check out other vegetable biryanis and non vegetarian biryanis in the links and have a great day. 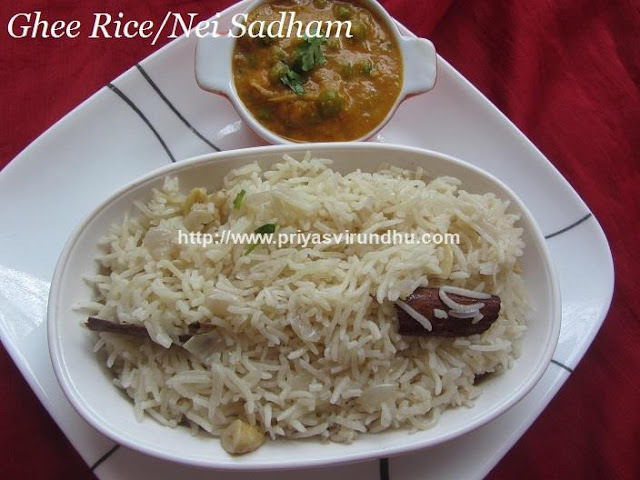 Jeera Rice Recipe is a very popular, common and famous rice recipe from North India. We find in all most all the Restaurant menus. 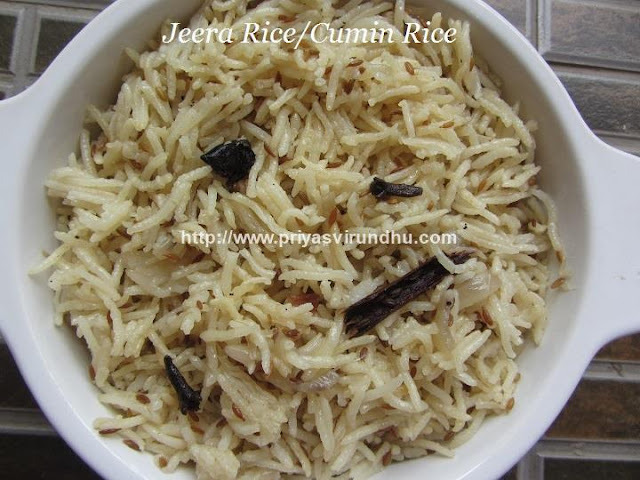 Jeera rice is a very flavorful rice and can be paired with any spicy vegetarian or non vegetarian gravies like Punjabi dumaloo, palak paneer, Lemon dal, butter chicken, palak chicken, paneer butter masalaetc. 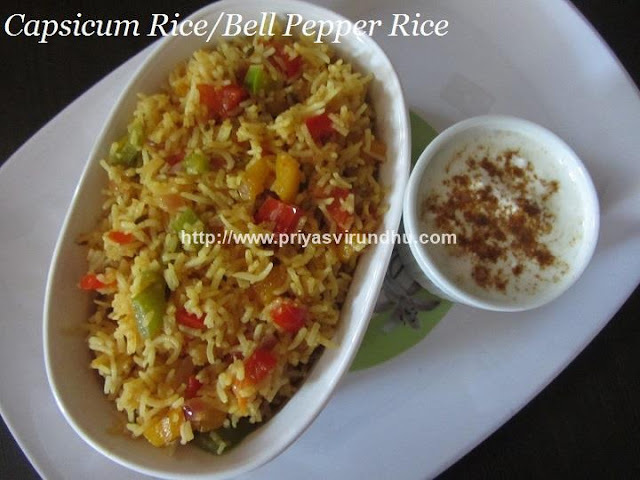 Do try out this wonderful and flavourful cumin rice/Jeera rice and post your comments here. Mean while do not forget to check out other interesting and tempting Vegetarian Rice Varieties and Non- Vegetarian Rice Varieties here. Narthangai/Citron belongs to lemon family. It taste similar to lemon, but has a unique flavour to it. 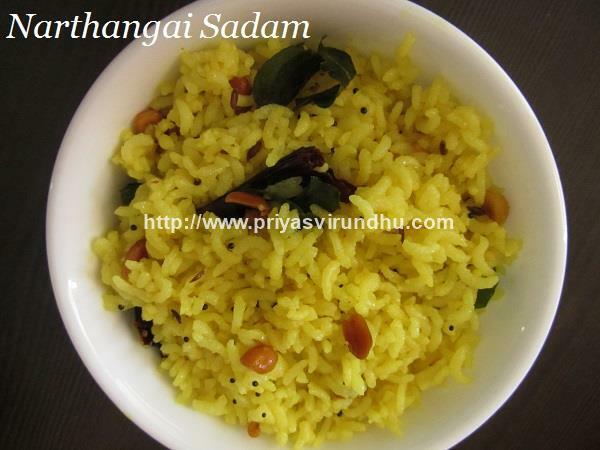 This narthangai sadam is very easy to prepare. It is a perfect lunch box recipe and can be packed during travel as well. 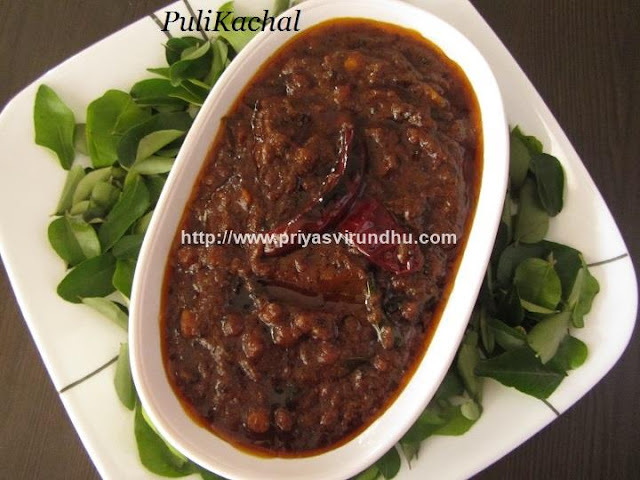 There are many other types of narthangai recipes like narthangai pachadi, narthangai podi, narthangai uppu oorgai, narthai thokku etc are prepared in Tamil Nadu. I will be sharing as many as possible in my future post. For now, I am going to share narthangai sadam with you all. Meanwhile check out other vegetarian rice varieties here. I have been thinking of posting this recipe for a very long time, but could not. This is a recipe which my grandma used to make, then my mom and now me. 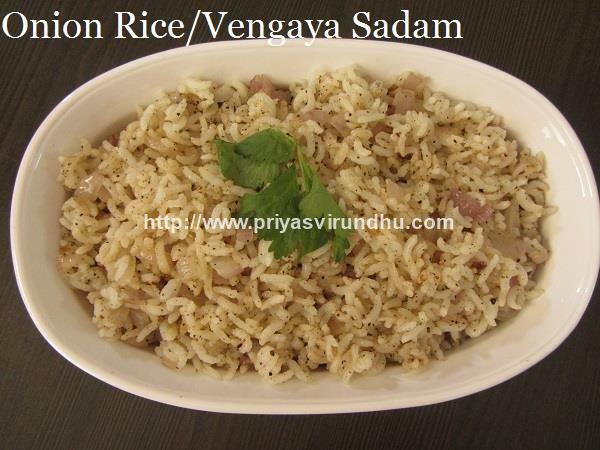 This onion rice is very special and has lots of medicinal values in it. My grandma used to make this rice, when someone is suffering from stomach pain. She used to say that the onions, cooked in ghee, combined with black pepper powder reduces the body heat, heals the stomach ulcer and cures the pain. I make this a lot in summer days to cool down the body temperature. My grandma makes this only with white onions, but I switch between white, red and small pearl onions depending on the availability of onions in my kitchen. Any way friends do try out this wonderful, healing Onion rice and post your feedback. Yes friends, as I promised earlier here is another mango recipe in the mango recipe series. Now that we are getting bags and bags of mangoes from our back yard, we are distributing a lot of them to friends, relatives and neighbours. 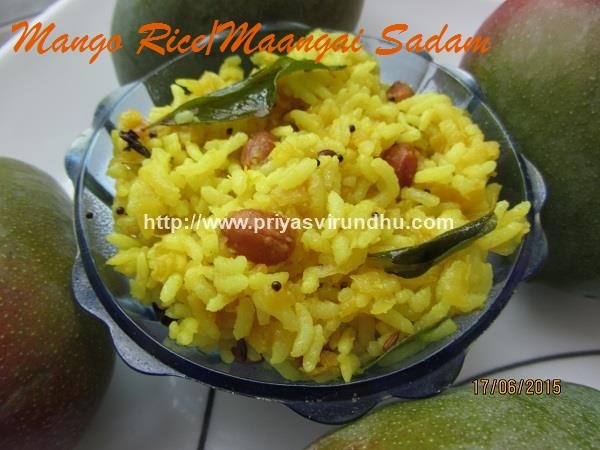 We plucked some raw tangy mangoes from the tree and made mango rice. 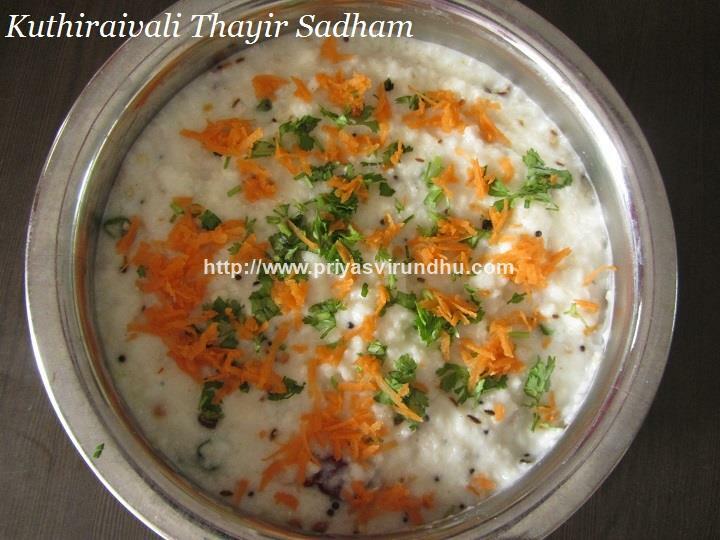 This rice is one special kind of variety rice, as it is prepared in Seemandham/Vallikappu [Baby Shower] Ceremony in Tamil Nadu. I have already posted Thengai Sadham/Coconut Rice, Lemon Rice/Elumichai Sadam, Thakkali Sadam/Tomato Rice, Curd Rice/Bagalabath, Bisibelabath/Sambar Rice etc. Do not forget to check out Vallikappu/SeemandhamRice Varieties here. 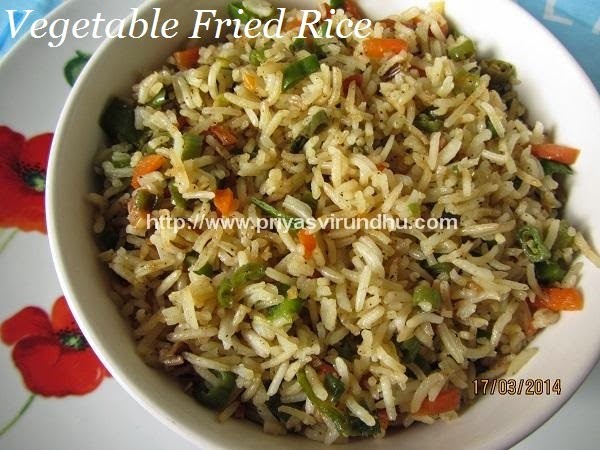 Today, I am going to share with you all very popular Vegetable Fried Rice with not much of introduction. I was thinking that I had posted Fried rice earlier, but realized that I have not posted it after one of my reader requested for it. Try out this delectable Vegetable Fried Rice and post your suggestions. “Biryani” is all time favourite among all the age groups starting from kids to adults. When we hear the word biryani it always rings thousand bells in our ears, this happens especially when you are hungry. I guess all of you will surely agree with me. 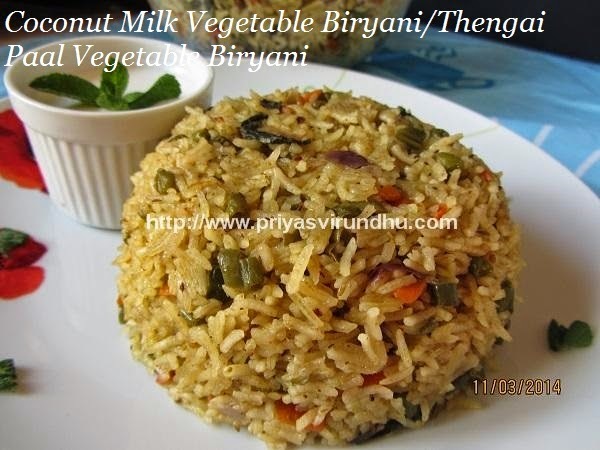 I am a great fan of biryani, this coconut milk biryani is my little girls favourite. It is very flavourful and delightful one pot meal which will surely make everyone happy in your house, do try it friends and let me know. 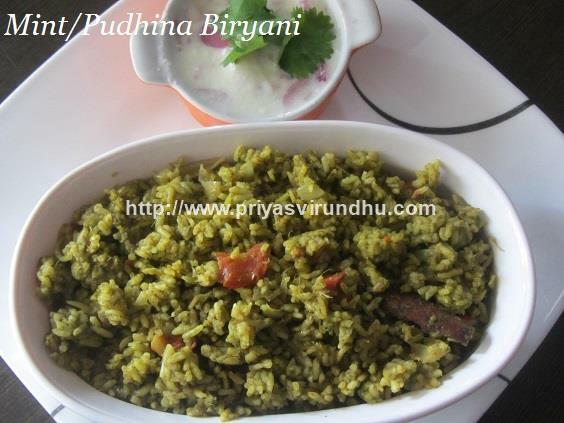 Do check out other vegetarianbiryani & pulav varieties here. 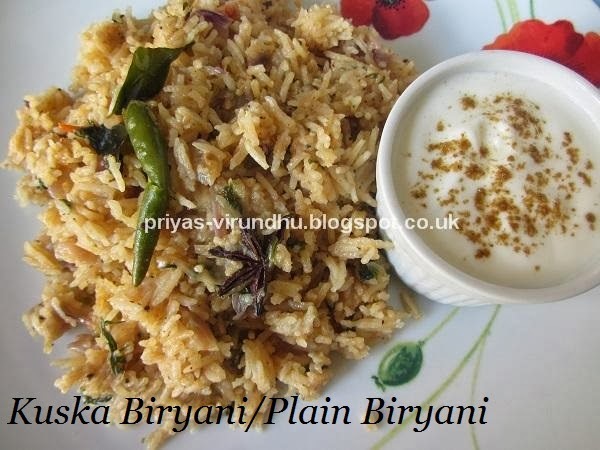 Today I am going to share with you all a very simple and quick Kuska biryani. This is a plain biryani without any vegetables or meat, yet very flavourful and delectable. This kuska biryani was a special request from my readers for quite some time. So friends without much introduction I am moving on to the aromatic kuska biryani. Check out other delicious Vegetarian Rice varieties here. Here’s how to make Kuska Biryani with step by step photos…. Bhogi festival is the first day of Pongal and is celebrated in honor of Lord Indra, “the God of Clouds and Rains”. Lord Indra is worshipped for the abundance of harvest, thereby bringing plenty of prosperity to the land. It is also widely believed that Bhogi Pongal is the Indra Vizha festival observed during the Chola period. 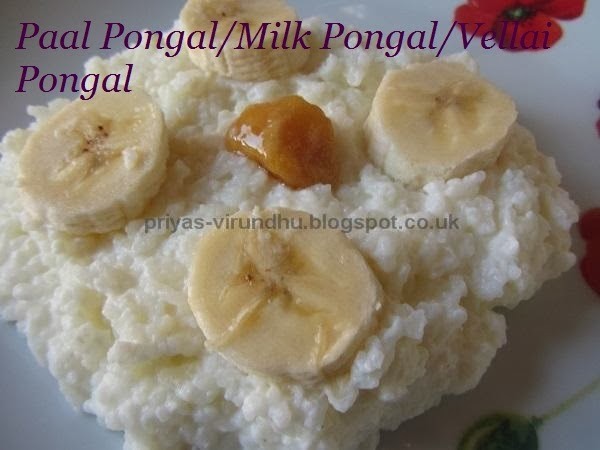 The first day of Pongal [Harvest festival] is the Bhogi Pongal is celebrated on the last day of the month of Margazhi.